We take recording audio on personal computers for granted nowadays. Without audio-in, we wouldn’t be able to use Skype, record a video for YouTube, or sing along with GarageBand. But before audio became a standard feature of the personal computer, there was a group of volunteers in Berkeley, California who figured out how to get sound into their Macs. A graduate student in Math, Michael P. Lamoureux, is credited with the original design of the digitizer hardware. Plans were published in the Fall 1985 BMUG Newsletter, enabling anyone handy with basic electronics to construct the device. The box plugged into the serial port on the back of the Macintosh. 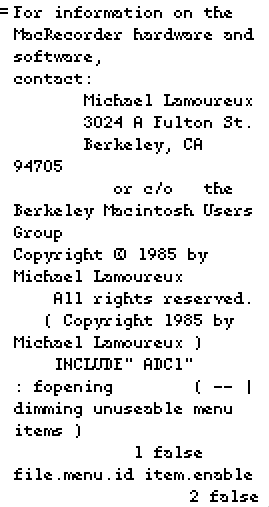 Intriguingly the article mentions “SoundTrack, a sophisticated sound editor.” This is undoubtably SoundEdit, the famous software written by Steve Capps in 1986. 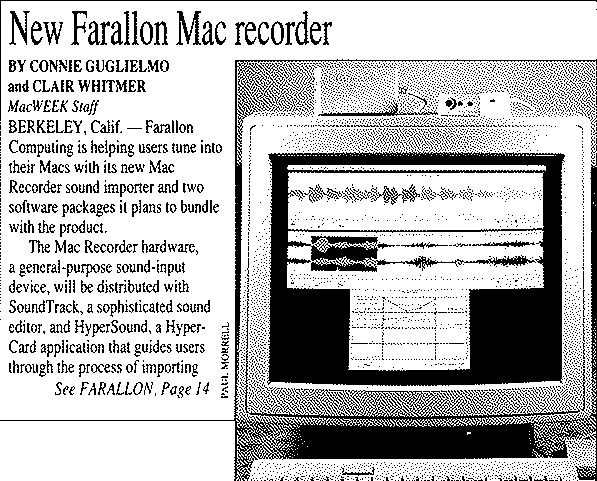 Farallon was perhaps considering renaming it to differentiate their version, but it shipped (as near as I can tell) as SoundEdit, not SoundTrack.